MANILA, Philippines â€” A 7.2 magnitude quake was recorded near Bohol Tuesday morning. The US Geographical Survey said that the quake was recorded two kilometers south of Nueva Vida Sur in Carmen town at 8:12 a.m. Philippine time. It had a depth of 33 kilometers. 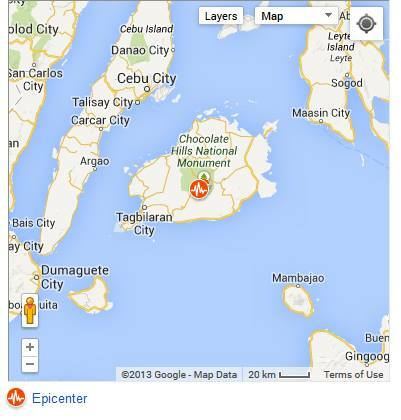 Residents in nearby province Cebu also posted on Twitter that they also felt the earthquake there. MANILA - (UPDATE 2, 8:53 a.m.) A strong earthquake has hit Central Visayas around 8 am on Tuesday. The US Geological Survey says the 7.2-magnitude quake's epicenter is about 2 kilometers south of Carmen, Bohol. This was confirmed by the Philippine Institute of Volcanology and Seismology. This was also felt in Bacolod City, Negros Oriental where it registered magnitude 5. The quake was felt for a minute, enough to sway picture frames on the wall to sway, residents said. 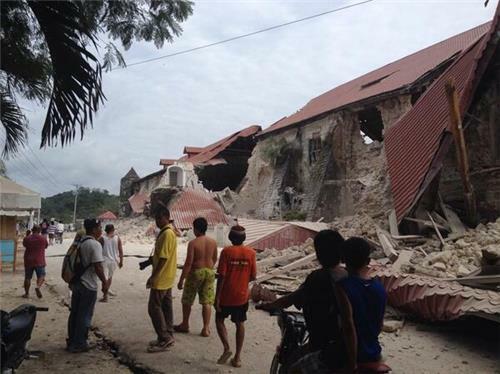 According to Cebu City residents, buildings along N. Bacalso Ave. have reportedly collapsed. Electricity was also down. A 5.4-magnitude aftershock has hit Nueva Fuerza, Bohol at 8:29 a.m.
MANILA, Philippines (3rd UPDATE) â€“ A shallow magnitude 7.2 earthquake struck Central Visayas Tuesday, October 15, state seismologists said. The quake struck at 8:12 am, and was centered 2 kilometers southeast of Carmen, Bohol (09.80Â°N, 124.20Â°E). The quake's depth of focus was 33 kilometers, and was of tectonic origin, the Philippine Institute of Volcanology and Seismology (Phivolcs) said in its initial report. The quake was felt across the Visayas and Mindanao. People as far as Zamboanga and Davao cities reported to have felt it. Aftershocks and damage are expected, the Phivolcs added. Duol jamo sa Southern Bohol. I'm going to call family to make sure okay ra ba sila sa Tagbilaran and Valencia. I hope and pray everyone is okay!!! Can any of our friends in Bohol update us? i intend to call my siblings in bohol but i'll give them time to "recover" first. so far, only my sister in cebu is updating me. they're all out of their houses in the subdivision, she ran back briefly inside the house to fetch her mask (she's had her fourth chemo session yesterday). they're okay, all dogs and cats okay, the glass panes in our library shelves are okay, she said. thank god. electricity is zero for the whole city as of now. 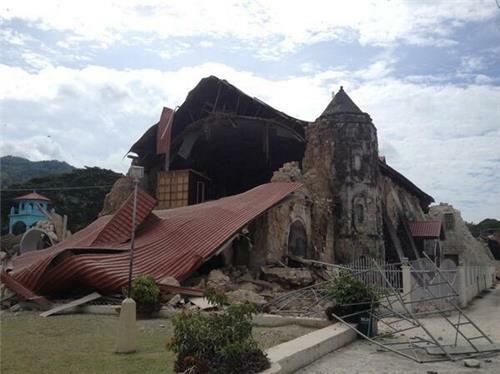 i hope that can rebuild the damaged churches, tita. especiall the bellfry tower in st. nino basilica. i've been to the loboc church before back in 2010. i'm hoping and praying that everyone in our province is okay!! i just want to make sure my lolo, my aunties, my uncles, and cousins are okay. in tagbilaran and valencia. and my little 3 year old doberman, si helmut. O God, who hast established the earth upon firm foundations, graciously receive the prayers of Thy people: and, having utterly removed the dangers of the shaken earth, turn the terrors of Thy divine wrath into the means of the salvation of mankind; that they who are of the earth, and unto earth shall return, may rejoice to find themselves citizens of heaven by means of a holy life. Through Christ our Lord. Amen. God our Father, look kindly on us in distress. May we come nearer to your presence to seek true refuge in this time of calamity. May we continue to trust, to hope and to love, give each other comfort and encouragement. May generous people come to the aid of those who are most in need â€“ those who lost loved ones and homes. Let your spirit strengthen us to face all the hardships and difficulties of the present and of the days ahead. We remember the counsel of Jesus, your Son, â€œLet not your hearts be troubled. Have faith in God and faith in me.â€ Help us to turn to you always for you know all our needs and you always provide for us. Thanks God that Tita A is okay, your pets and your belongings are alright. Let's pray that our family, friends in Bohol are safe from all harm; physical, mental and spiritual. just talked with my brother who's based in baclayon. the women didn't take chances. they've moved to higher ground for fear of a tsunami. baclayon church belfry and frontage damaged. how sad. I've sent text messages to Engr. Votives, thankfully they're doing fine and safe... My relatives also are doing fine in San Fernando, Cebu.. Will keep on praying for them.. We felt intensity 3 here..
fr chic is in bohol now, lorenz, right? i'm sure he's okay. i hope he shares with us his experience. what a welcome for him. earthshaking. 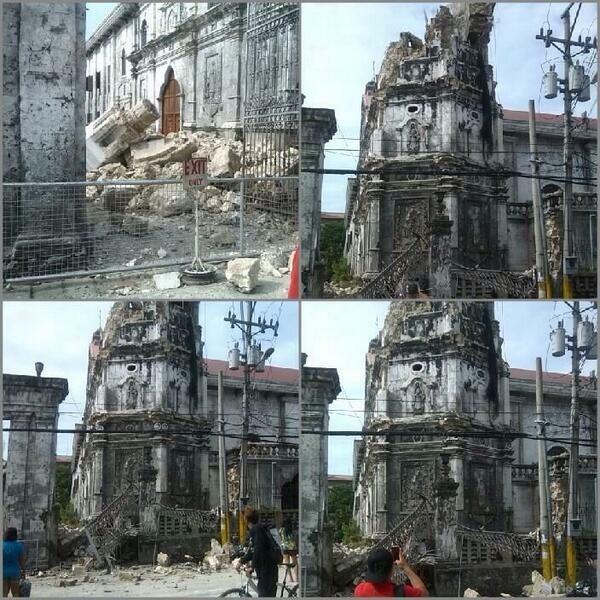 another angle of the damaged historic church of loboc. how sad.